In rejecting falsely homogenizing accounts of women's lives, feminist economists have, in recent years, unlocked the multiple ways in which gendered relations of dominance and subordination are maintained. One of the key differences they study of Muslim, Sinhala and Tamil Households. In Sri Lanka examines both the commonality of patriarchal structures and economic Problems in such households, as well as the differences created by the ethnicities that divide them. The author looks at the nature and reliability of kinship support for female heads and the reciprocal obligations in terms of female propriety and conventions in conduct extracted from female heads. She Questions development policies premised on the patriarchal household and argues for a recognition of diversity and complexity. Kanchana N.Ruwanpura is an Assistant Professor at Hobart & William Smith Colleges, USA and will soon be taking up an appointment as Lecturer at the School of Geography, University of Southampton, England. She did her undergraduate work at William Smith College. USA and holds a doctorate from the University of Cambridge, England. She has done research and teaches in the area of feminist political economy, gender, development and labour market issues; and has a number of published and forthcoming essays in journals such as Feminist Economics, Cambridge Journal of Economics and Gender, Place and Culture. She is a recipient of the AAUW International Fellowship (1998-99), Humboldt Research Fellowship (2002-03) and the winner of the annual Rhonda Williams Prize in 2005. Development economists often consider Sri Lanka to be an exemplar of human development (Sen 1981:301-9,1984a: 496, Anand and Kanbur 1995, Basu 1995:373-81). Prima facie, there are very good reasons for doing so. Sri Lanka's Performance in the social and human development sphere is impressive, and it has been achieved despite its low per capita income as well as the protracted and bloody ethnic conflict (Sen 1981, 1984a, 1988, UNDP 2001). But it is not only Sri Lanka's human and social progress that is lauded by development economists. The country is highly regarded ever among feminist economists for the relatively favourable position of its women, reflected in the egalitarian achievement in gender-based human development indices (HDIs) as well as matrilineal and bilateral inheritance patterns and property rights (Sen 1984b: 383-4, Agarwal 1990, 1996, Humphries 1993: 228, Klasen 1993:23). What validity do these assessments have when translated into women's capabilities at the micro-level? Are they hasty conclusions that need closer scrutiny? Does a detailed search reveal many paradoxes in this serendipitous island? I use female-headship as the entry point for this study. My concern is the need for caution, especially on the part of feminist economist, in reading Sri Lanka as a feminist nirvana. I use a feminist framework to examine the eastern Sri Lankan experience and uncover the patriarchal ideology and institution that continue to influence the lives and choices of local women. By focusing on changing household formations, structures and relations and the playing out of gender relations within these units, I illustrate, using case studies, how female heads of households (henceforth referred to in this book as 'female-heads'), irrespective of ethnicity, remain trapped in patriarchal community structures. Using this focal point I unravel the patriarchal assumptions underlying economic readings of the household, where the household is treated as an isolated unit without social, historical and political dimensions (Humphries 1998b: 223-4). My purpose is to include such issues as gender, ethnicity and changing household formation in eastern Sri Lanka, hitherto left out of development literature (Aturupane, Rodrigo and Perera 1997). I also advocate the need for a critical standpoint to enhance insight into social realities and complexities. My contention is that social realities and complexities. 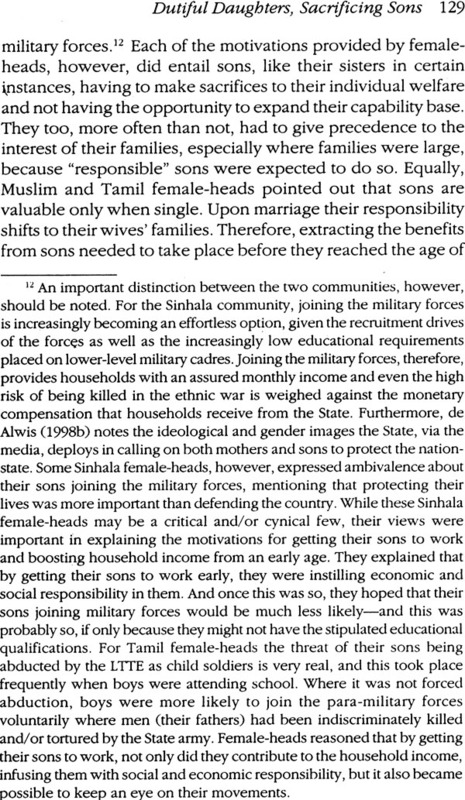 My contention is that social structures in eastern Sri Lanka are embedded in patriarchal systems that manifest themselves in distinct ways for female-heads across ethnic communities. In addition, this exercise enables me to contribute towards feminist theorizing of the household. My study of female-headship in eastern Sri Lanka describes and explores specific kinds of house hold formation and relationships within them. In this chapter I begin by developing a feminist analysis of the patriarchal structures and ideologies that operate within eastern Sri Lanka. I then outline the structure of the book to guide readers through the arguments I make in the subsequent chapters. This examination discloses patriarchal structures as a prominent feature of the Sri Lankan social fabric. These findings mean feminist economists need to be cautious in applauding Sri Lanka's gender-based HDI achievement and/or matrilineal communities. Uncritical optimism may place one in a fool's paradise.